See Katy Perry's Prism Tour Live in 2014! Katy Perry’s Prismatic World Tour is quickly becoming a huge sensation! Her new dates in the United States and Canada have yet to go on sale to the general public, however, she’s already doubled up on a few cities by adding 2nd shows! Katy Perry is known as one of the top female singers and entertainers of today. Her huge success as a singer has helped her become a massive success. Her concerts sell out in minutes, her “KatyCats” are always following her every move and her new music is always among the top of the sales charts. The Prismatic Tour will begin in Europe and then bring her home to the United States. From there, she is expected to travel to Australia and Asia (towards the end of 2014). No official announcement has been confirmed regarding Australia, New Zealand, Japan, China and other nations after her USA and Canada tour is complete. Still celebrating the release of her new album “PRISM” Katy Perry headlined the “We Can Survive: Music For Life” charity concert at the Hollywood Bowl in Los Angeles on Wednesday night. Special guests included Bonnie McKee, Ellie Goulding, Sara Bareilles, Tegan & Sara and Kacey Musgraves. The sold out event was a celebration of not only her album, but a lady power evening with great messages to support young women battling breast cancer. It wouldn’t be a full show without Perry singing some of her top hits including “Teenage Dream” and “I Kissed a Girl”, and also showed off some her newer music from Prism like “Dark Horses” with Juicy J, “Roar” and more. Perry’s album has been released, her super successful charity concert has ended, so what’s next for the pop princess? A world tour! Katy Perry will be embarking on the Prism World Tour next year. The full announcement and Katy Perry Prism Tickets will be available soon. Much to Katy Cats surprise two new songs were leaked from Katy Perry’s upcoming album “Prism” Tuesday morning Katy Perry fans were jumping in glee as “Unconditionally” and “Birthday” hit the web. With only a few days away from being released the Prism album is hotter than ever, even with new songs being leaked. “Roar” is still holding on to the top spot on the Hot 100, and Perry surprised guests on Saturday Night Live with a dance performance of her new tune “Walking On Air” So far the Prism album is setting itself up to be a mega hit! Before Perry announces her world tour fans still have the opportunity to see her live at the Hollywood Bowl on October 23rd, the day after her album is released. This special show at the Hollywood Bowl in Los Angeles is to benefit the Young Survival Coalition and will feature Sara Bareilles, Ellie Goulding, Tegan & Sara and Kacey Musgraves. Stay tuned for the announcement next week for the Prism World Tour! As always you can purchase your tour tickets on the Katy Perry Prism Tickets page. Katy Perry Prism Tour Announcement Coming Soon! Katy Cats get ready! The announcement for the Katy Perry’s “Prism Tour” will be right around the corner! With Perry’s latest album Prism due in stores on October 22nd it’s only a matter of time before dates are revealed for a Katy Perry World Tour! Perry recently announced a charity show called “We Can Survive” benefiting the Young Survival Coalition which is being held on Wednesday October 23rd at the Hollywood Bowl in Los Angeles. Perry has asked a few fabulous ladies to join her with this show including Sara Bareilles, Ellie Goulding, Tegan & Sara and Kacey Musgraves. Sources are claiming that Perry might be making the big announcement immediately following the release of her album, and it seems fitting that during the charity event that Perry might leak some details about the World Tour! 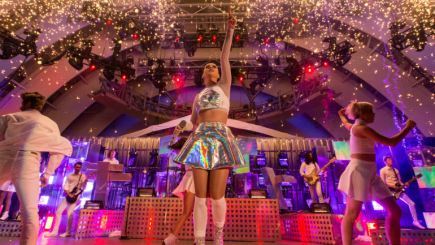 You can stay up to date on all Katy Perry shows as well as purchase tickets right at the Katy Perry Prism Tour Tickets page.